Orange blossom set out from Seville, in the form of sweet essence... with a hint of bitterness, and in return, Manila sent cinnamon, in the form of oriental flavour. The galleon was loaded with cargo in the Orient, and set sail again for the Western world. Once more, it stopped off at Acapulco, in Mexico and in Veracruz, but this time there was another important and significant stop-off, in Havana, "the pearl of the Caribbean". It was there that all the ships gathered before setting sail together for Spain, each vessel carrying merchandise, people, ideas, etc., gathered from America and Asia and bound for Europe. 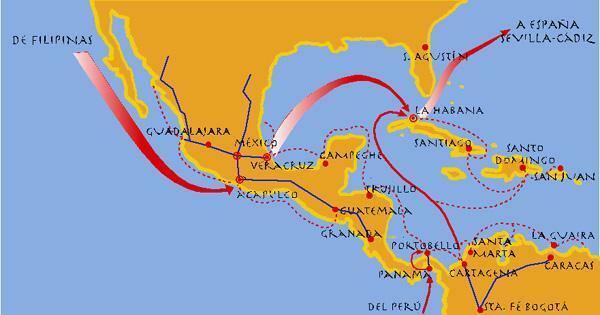 Chinese silks and spices from the East Indies were shipped from the Philippines to Mexico, Cuba, Seville and Cádiz. 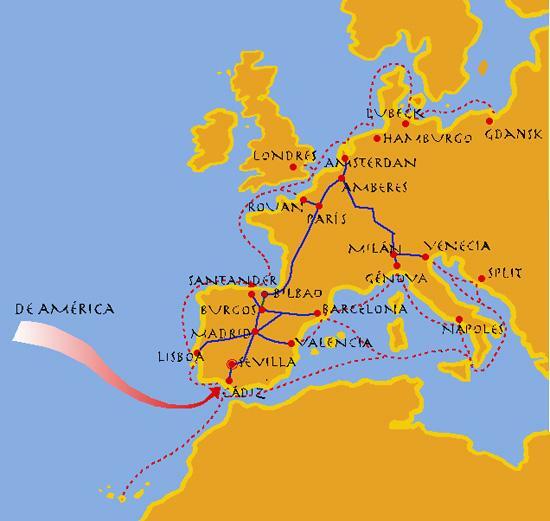 The return voyage eventually reached Seville, which in 1717 ceded part of its American and Philippine trading market to another city closer to the sea and of a more seafaring nature: Cádiz. The longevity and persistence of this transoceanic route came to an end in 1813, when Mexico, one of the essential territories on its stop-off route, gained independence. The Suez Canal was opened later. The galleon has returned. With a cargo of new cultural ideas and common history, it draws the Western world and the Orient closer to one another, across the oceans and crossing space and time. An inter-cultural voyage allowing both worlds to get to know and acknowledge one another. With sails like lighted candles, unfurled and catching the wind, the galleon leaves port once more. 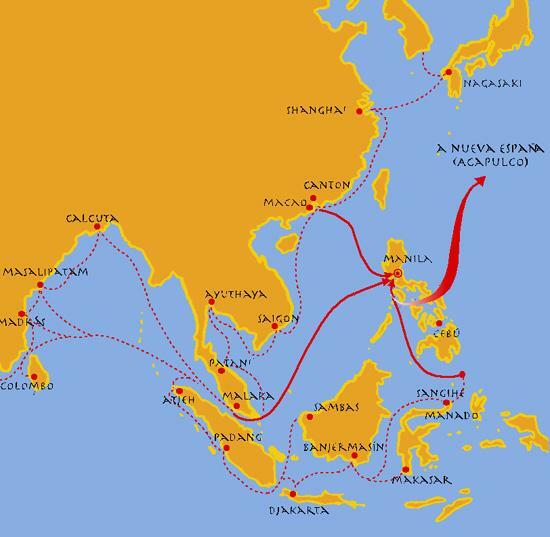 Intercontinental map showing the outward and return sea routes used between Spain and Manila. Alejo Berlinguero. 1772. AGI As from the end of the 18th century, the vessels of the Spanish armada sailing for the Philippines followed the route which passed round Africa and across the Indian Ocean, which was different from the route followed by the Manila galleon which crossed the Atlantic to America, and then crossed the Pacific. 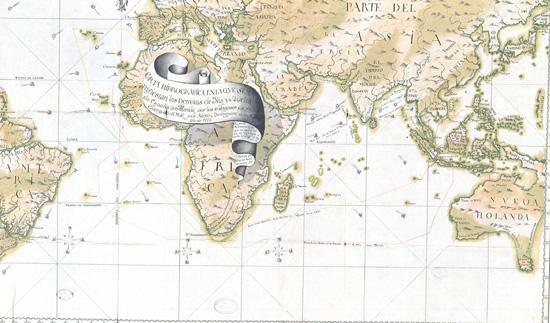 Map of the sea route followed by the pilot Francisco Xavier Estorgo y Gallegos on his voyage from Manila to New Spain. 1770. AGI The round trip or return voyage commenced in July or August in order to take advantage of the monsoon season winds and the Kuro-Sivo currents. 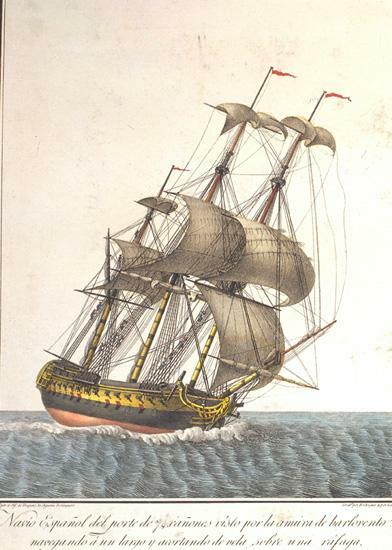 The galleon reached Acapulco in December or January after a long voyage. On arrival there, a large part of the merchandise it carried still had to cross America and then be transported from Havana to Seville and Cádiz. 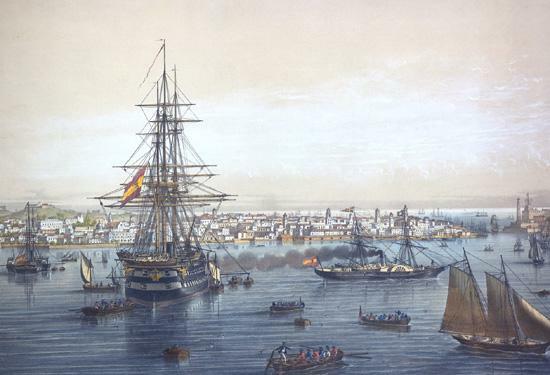 View of the port and bay at Cádiz. SGE In 1717 Cádiz officially replaced Seville as the control point for interoceanic trading with America and the Philippines. In a very short space of time the city underwent a great increase in prosperity. View of the port of Havana. MN Havana enters the era of progress: the old sails are replaced by steam funnels. 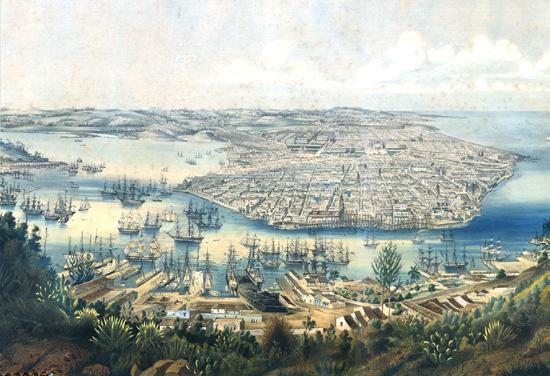 View of the city and bay of Havana. 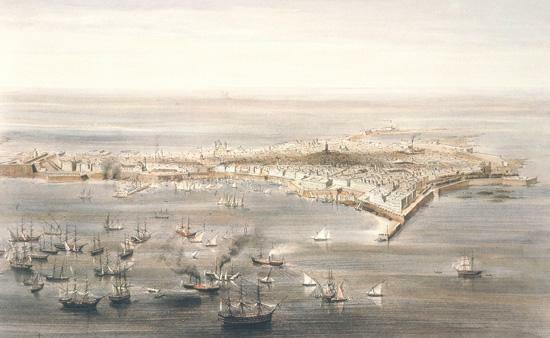 MN Until free trading with the Indies was introduced at the end of the 18th century, Havana held a monopoly over the exit from America of Spanish vessels bound for the Peninsula. Its bay was the anchorage for all the fleets arriving from Veracruz, Cartagena de Indias and all the ports on the Caribbean coasts before they set out together on the return trip. Samples of the country's produce. La Ilustración Española y Americana. 1888. BN Philippine trading activity spread out over the whole of its surrounding geographical area. 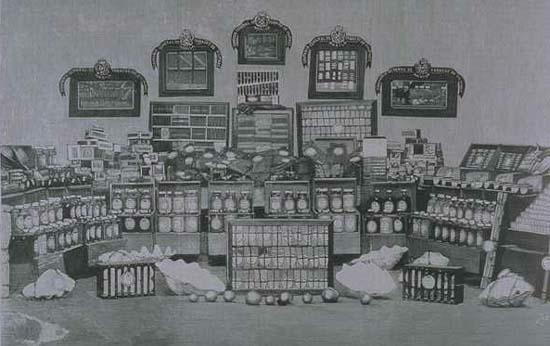 This photograph shows a range of samples of natural and industrial products which was prepared for presentation to the Japanese government. The days of the future spread out before us like a string of lighted candles, candles that are golden, warm and full of life. The days of the past are left behind, their candles a mournful, burnt out string, the wisp of smoke still curling from the more recent bygone days, cold, twisted candles to be cast away. I look ahead at the lighted candles before me.